Another month has come and gone, and I’m standing her with a gaping look on my face. Cause … how? Like WHERE did October go? I vaguely remember something about Fall Break at the beginning of the month, then all of the sudden it was Halloween, and BAAM it’s November. I didn’t even have TIME to accomplish my goals for October. Okay, that’s probably a bit of an exaggeration, but it certainly didn’t feel like I had the time. And the Week of the Flu probably didn’t help either. Seriously, I did nothing in reference to my goals set in October. I accomplished a lot, just not a lot of what I set forth to accomplish. So, my goals for November will look exactly the same. 1. Finish 2nd edits on Armor of Aletheia. I was a little late getting the initial edits back to my editor, then she was a little late getting them back to me … And I actually did not even get them until about a week ago. Now I’m scrambling to get those done ASAP. Unfortunately, I have an edit for a client that must get done first. Hopefully that will be done tonight or tomorrow. Must. Do. All. The. Things! 2. Get caught up on marketing plans for AoA. So, in August, I sat down and mapped out the next few months of marketing plans in preparation for the release of AoA. I kept up for about a month … then fell behind. So, now I need to go through and get caught up on some 0f these. I’ve stepped back from some of my responsibilities in other areas in order to make some room in my schedule to do this! 4. I need to drink more water! Not just tea, but water. So, my goal is to drink at least 40 oz. of straight water in addition to my tea. The plan is to drink tea with meals and water in between. We’ll see how that works. What about YOU? 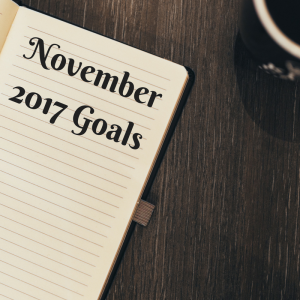 What are your goals for November? Tagged Armor of Aletheia, Goals, Happy & Healthy, Health, Writing Life.